New Saturday Hours From 9:00am-3:00pm! Home » Our Doctors » Taylor Hibbs, O.D. 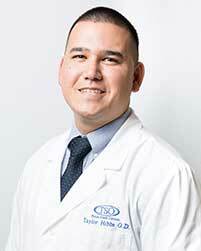 Dr. Taylor Hibbs was born and raised in beautiful Kaneohe, Hawaii. He attended Brigham Young University in Utah and earned his Bachelor of Science degree in Exercise Science with a minor in Business Management in 2014. He went on to earn his Doctorate of Optometry from the University of Houston College of Optometry, graduating in May 2018. He is a licensed Therapeutic Optometrist and Optometric Glaucoma Specialist. He is a member of the Texas Optometric Association and the American Optometric Association. Dr. Hibbs became passionate about eyesight after his then three-year-old niece was prescribed bifocal glasses to correct an eye condition. Dr. Hibbs values establishing good relationships with his patients and giving them the best personalized care with all comprehensive eye exams, contact lens fittings, and the diagnosis and treatment of different eye diseases. Dr. Hibbs enjoys working with patients of all ages and is an InfantSee provider. Dr. Hibbs enjoys spending time with his wife and daughter and friends. In his free time he enjoys watching college football, making and eating good food, and hosting gatherings with friends. He is fluent in Spanish after living in Guatemala for two years on a church service mission and enjoys Latin American cultures and foods.